Ladies stunning and flattering wedding guest dress/party Size 16 Zip fastening By oasis New VGC Please ask any questions Always combine postage, as in as many items in one parcel sto save on postage Pay pal please within 24 hours of winning bid Any problems, don't leave negative feedback,I always wash and make sure items are in good condition, but sometimes an item slips thru the net so please email me first, if their is a problem with the item not mentioned you will obviously get a full refund and return postage paid, no questions asked....i am a very fair and friendly ebayer!! My feedback is extremely important to me......thankyou for looking at my items. Zip to fasten at rear. Great for a special occasion. Machine washable. Smoke and pet free home. UK Bidders only please. Ladies Dress Size 16 by Oasis Belle Range. Stunning Dress in vivid Teal Green, with bold floral tropical print in Red, Pink & White. Long side zip. Length (shoulder to hem) 35". OASIS BLACK SILK & COTTON MIX PETER PAN COLLAR SPECIAL OCCASION LINED TUNIC DRESS. Leather effect TRIM around neckline. Size 12 OASIS gold & black dress. Good condition from pet and smoke free home. This is a really pretty, bright summer time dress. It floats comfortably and it doesn’t require ironing. Worn once. 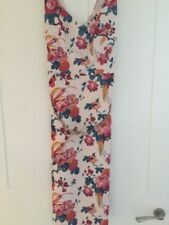 Floral Frocks by Oasis size 10 New with tags - £50.00 Straps included to be worn either way Side zip fastening Fully lined Length from neck to hem 28"
Beautiful occassion dress, only worn once to a wedding. Ladies OASIS Size 14 Red Cotton Pencil Mini Dress. Lining: Polyester. Machine washable. Presented in excellent condition is this gorgeous dress from Oasis uk size 16. Oasis sizes are very snug. Fit & Flare. White with a self colour textured pattern. Green belt. Round neckline. Hidden back zip. Great condition. Size 16. See all pictures for measurements. Thanks for looking. Very nice Blue Floral Pencil Occasion Cocktail Dress Size 16 Oasis. Very good used condition. Please check my other items I combination postage. Thank you. Ladies Oasis Grey Shift Dress Oriental Print Purple Black Uk Size 14. Condition is Used. Dispatched with Royal Mail 2nd Class. Oasis dress size 14, Red Floral, Good Condition . Condition is Used. Dispatched with Royal Mail 2nd Class. Very, very beautiful evening dress. Shop price 60 pounds. Only wear once in wedding party. Selling 30 pounds. Size 10. It is a skater style with a navy belt for that added detail and has a V detailing on the back. It is an occasion dress that would look lovely for a wedding or prom or similar. I have advertised it as 12-14 even though label says 14 and would fit a size 12. Oasis White Floral Occasion Dress. Size 6. 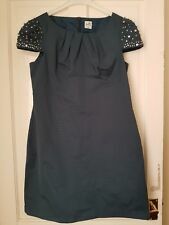 Gorgeous ladies dress from Oasis, size 14. Oasis Floral Multicoloured Occasion Dress UK 8 Butterfly. Worn once and it is now sadly too small for me. Fully lined Gorgeous print perfect for summer Dirty mark to back of collar as seen in last pic - blue colour no idea what it is! Might come out in the wash Can't see any other flaws RRP £75 so grab yourself a bargain! Pulled in for photo slightly the dress is a size 12. great condition hardly worn! Wash care: Do Not Pile Damp, Iron On Reverse, Remove Belt Before Cleaning, Use A Mild Non-Biological Liquid Detergent. This dress features a long sleeve shirt top half and a contrasting black pencil skirt. OASIS STUNNING CREAM & WHITE FLOWER JEWELLED STRAPLESS DRESS SIZE 12 BNWOT!! This is a stunning dress by Oasis size 12 BNWOT! The dress is designed to be fitted on the top half before flowing down beautifully. The quality of the material is amazing and the dress looks even better than the photo's show. Fully lined with a cotton slip & a netted petticoat as shown in pics. A zip on the left side. The bust has a little bone on each side for support & four little material slots for straps if desired. Used but in good condition. Simply stylish, classy and elegant one shoulder dress fromOasis by Belle. Is a sleek cut sheath style dress, it has sheer pleated frilly trim on the right side of the dress. Just simple and beautiful. Belle by Oasis. 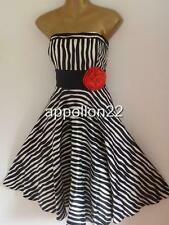 Stunning ball / evening / prom / formal or races dress UK 6. Fully lined. Prices quoted are for mainland UK only. Oasis burgundy lace dress - shirt style with buttons hidden. This pretty dress is perfect for a special occasion. Worn but in excellent condition. What you see is what you get. Stunning Fully Lined Colbolt Blue Dress From Oasis Size 12. Good used Condition ,from a smoke free home Dispatched with Royal Mail 2nd Class. womens black jersey star print dress Oasis size large. Condition is New with tags. Dispatched with Royal Mail 2nd Class. OASIS Cotton blend lace fit and flare dress - feminine, flattering shape - more fitted at the top and then the skirt flares out. Had a clearout - lots more clothes listed including more from OASIS. Feature back central zip with pull tab - refer to photo.